Canon 70D features newly developed 20.2MP APS-C CMOS Sensor and improved ISO range. Canon EOS 70D features a 20.2 megapixel APS-C CMOS sensor and DIGIC 5+ processor, 70D offers native / standard ISO sensitivity of 100-12800, expandable upto 25600. Canon 7D comes 18.0 Megapixel APS-C size CMOS sensor, Dual DIGIC 4 image processor, 7D offers ISO 100-6400 (expandable to 12800). 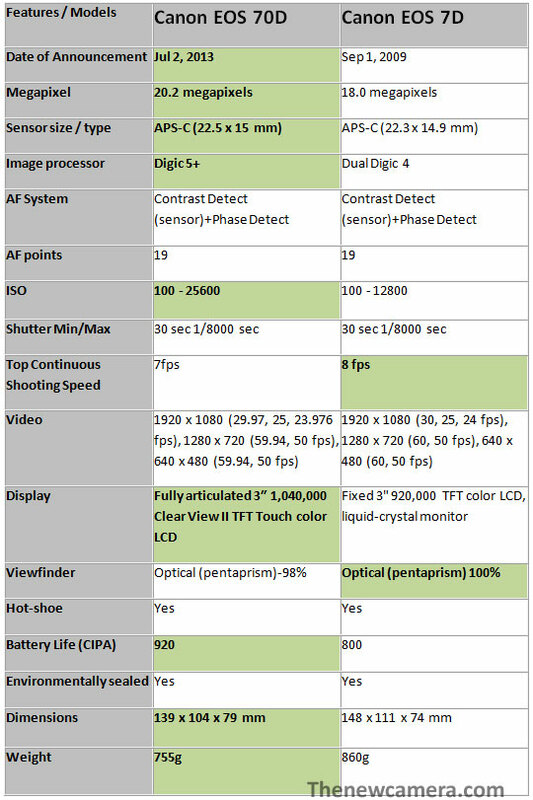 Canon 70D and 7D features same AF system, Both camera features 19 point AF system, but due to dual pixel AF technology the Canon 70D does fast AF during live view and movie mode (Phase AF system active during live view). Advance image processor in 70D: Canon 70D is using DIGIC 5+ image processor, 7D is using Dual Digic 4 image processor. Top-continuous shooting speed: Canon 7D offers high speed shooting at 8fps @18Mp, Canon 70D offers 7fps @20.2 Mp. Display: Canon 70D offers bright 3.0″ 1,040k-dot vari-angle Clear View II touchscreen LCD monitor, Canon 7D comes with 3″, 920,000-dot TFT LCD. Built-In Wireless Connectivity: Canon 70D Wi-Fi provides remote control over the camera’s exposure settings (aperture, shutter speed, and ISO) as well as focus and the shutter release from an iOS or Android mobile device when using the Canon EOS Remote app. Built-in HDR: Canon 70D features built in HDR, reducing the time needed to manually overlay images in post-production. other new feature that 60D users will find in 70D is Multiple exposures, up to 9 exposures can be recorded onto a single file using 2 distinct settings for control. Verdict: Canon 70D AF is same as 7D, but due phase AF pixels in the sensor the 70D will do fast AF when used in live view and movie mode, the sensor is new so you get 20.2 Mp resolution and ISO up-to 25600, other features include vari-angle touch display, WiFi and Built in HDR modes. Professional shooters will may not see major improvements in the cores specification that they want, since the AF system, Continuous shooting speed remains same, Canon 7D still shooters should wait for upcoming Canon 8D or 7D MkII camera, If you are a Still+Video shooter you must upgrade you DSLR to 70D. So 70D or 5D Mark II? If you are a still shooter than Canon 5D Mk II is a excellent choice. You can’t compared FF vs crop sensor. 70D is a great camera. After 2,5 years The best camera – Sony ilca 77m2. So what you say now?